The classic definition of folklore as a study and discipline holds up the value of face-to-face interaction-- stories or fiddle tunes or traditional recipes being shared between people in real time. In the age of the internet, though that has been expanded-- you can learn a ballad note-for-note off of Youtube, pick up an old recipe via a blog (ahem), share a story on your Facebook page. Face-to-face interaction is still preferred in the field, generally, but the notion that you can learn and share cultural traditions, information, and knowledge via digital forms is now widely accepted. I too value the person-to-person relationship, but I've also gained a lot from online communities, particularly in the world of food. I've connected with people like Tara of Smoke Signals Baking, who I'd heard about in real life from mutual friends, but our real life meeting was brought about by our Instagram friendship. A few months ago my friend Jess and I met Camille of Wayward Spark, talking ecstatically about the food and farming worlds over bowls of ramen one brisk spring evening. Another connection, most pertinent to this post, is to Austin, Texas baker Trisha Beezup. I'm not sure how I actually found her, but I was swiftly inspired by her innovative and fanciful pie creations-- namely, piescream sandwiches. She's done a few variations: handpies stuffed with ancho brownie filling surrounding the ice cream, pie crust cinnamon rolls sandwiched with a salted caramel ice cream drizzled in chocolate, and strawberry basil crumb pie mixed into buttermilk ice cream. I mean seriously?! These pickled strawberry piescreamers are maybe not as imaginative or decadent as Trisha's incredible creations, but I owe her a sincere nod for her wild ingenuity and the generosity to share it. 1. Place vinegar, sugar, salt, peppercorns, vanilla bean and 1/2 cup of water in a medium saucepan and bring to a boil over medium heat. Simmer until sugar and salt dissolve, then remove from heat and let cool until lukewarm. 2. Meanwhile place mint sprigs in a pint canning jar. Cut a shallow x into the hulled end of each strawberry and place in the jar. Once vinegar mixture is lukewarm, pour into jar over strawberries. Seal, let cool completely, and place in the fridge overnight (since I was planning to keep them in the fridge and use eminently, I didn't seal them via water bath canning, but you could if you wanted them to be shelf-stable). Pickles will keep for up to 2 weeks in the fridge. 1. Prepare half of Nothing in the House pie crust as per the directions. Preheat oven to 375 degrees F. Once the dough has chilled for at least 1 hour, roll out on a clean floured surface to about 1/8-inch and cut into circles (mine were 3-inches in diameter). 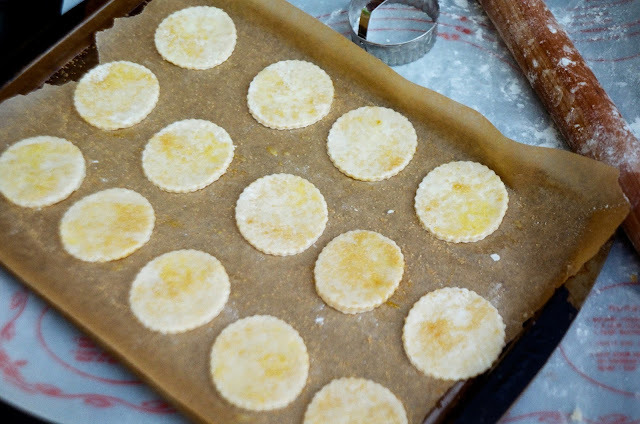 Place pie crust rounds on parchment-lined cookie sheet 1-inch apart, brush with egg wash and sprinkle with Turbinado sugar. 2. Place cookies in freezer for 15 minutes until hard, then place on middle rack of preheated oven and bake for 10-15 minutes, until golden brown. Remove from oven and let cool. 1. Place heavy cream, sugar, and salt in a small pot and simmer over low hear until salt and sugar completely dissolve, approximately 5 minutes. Remove pot from heat and set aside. 2. In a medium bowl, whisk egg yolks. While whisking constantly, slowly pour in about one-third of the hot cream into egg yolks. Then immediately whisk the yolk mixture back into the pot with the rest of the cream. 3. Return pot to medium-low heat and gently cook until the mixture is thick enough to coat the back of a spoon (about 170 degrees on an instant-read thermometer). Strain through a fine-mesh sieve into a bowl, and let cool to room temperature before covering and chilling at least 4 hours or overnight. 4. Once chilled, churn in an ice cream machine according to manufacturers’ instructions. While churning, strain pickled strawberries from their vinegar liquid (reserve vinegar for drinking; you've essentially made a shrub). When ice cream base begins to set, stir in pickled strawberries (if your berries are large, you may want to halve or quarter them. I kept mine whole as they were quite small). Continue to churn until completely set, then transfer to freezer and freeze for at least 4 hours before assembling piescream sandwiches. 1. Once ice cream is set and pie crust cookies are cool, scoop a generous scoop of ice cream onto pie crust cookie and sandwich with another cookie. 2. Place in freezer and let set for 1 hour before serving. This will make the whole shebang a much less messy eating experience, but I understand if you can't wait that long... ENJOY! Labels: ice cream, ice cream sandwich, Pickled Strawberries, Pickled Strawberry Ice Cream, Pickled Strawberry Piescream Sandwiches, piescream sandwiches, shrub, Washington D.C.